A wonderful group of people have banded together to raise money for those affected by the Christchurch earthquake through donations of handmade items. Crafters from around the world have been donating beautiful and unique items, which are being listed on New Zealand's Trade Me online auction site. Although we are some distance away from Christchurch here in Perth, Australia, I feel particularly close to it all because my parents have been on holiday in NZ for the last month and flew out of Christchurch the day before the earthquake. They had spent that day in the CBD of Christchurch, looking at all the places that were ruined by the earthquake the day after they saw them, including the cathedral. One of the things that had particularly affected my parents (apart from the terrible human suffering) was that they could see the incredible effort Christchurch residents had made to rebuild the city since the previous earthquake in September 2010. They were extremely impressed by the beauty of the city and the events being held to attract visitors. They mentioned the flower displays outside the cathedral and the beautiful dresses created by an artist on display in a department store window as being very impressive. 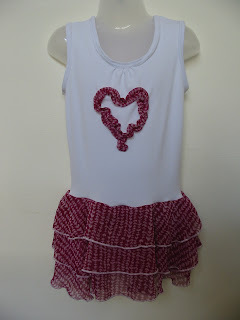 So, I have donated one of my meggipeg girl's dresses to the 'Handmade for Christchurch' fundraiser. This is the dress (which was featured here in an earlier entry of this blog). For those interested in donating or finding out more, please see the 'Handmade for Christchurch' Facebook page. Go Kiwis! Thinking of everyone in New Zealand.